One day many years ago, Swami distributed ice cream to the boys. The brand name was JOY ice cream, and it was gifted by a devotee who owned the company. While boys were enjoying the ice cream, Baba went round as usual, asking the boys how they liked the ice cream. And then suddenly He asked a boy, "Boy what do you think God is like?" The boy was taken aback. He was fully immersed in enjoying ice cream, and God was, at least at that moment, far from his mind! Swami asked another boy the same question, and he too blinked. 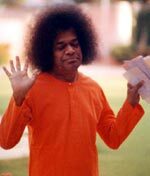 After drawing a blank response a few more times, Swami smiled and slowly said,"God is SWEET like ice cream!" The boys became attentive. Swami continued, "God is SOFT like ice cream!" By now, the boys had stopped eating, while Swami went on, "God is COOL like ice cream!" And then the punch line: "He gives JOY like ice cream!" What a delightful play on words! Sage Ramakrishna Paramahamsa once declared, "God alone can make complicated things simple, so simple in fact that even a child can understand." How very true!